47 Oct 1915 There were 19 present at the Oct. meeting of the Grinnell W.C.T.U. which met at the Cong. church. Mrs. D. P. Breed led the devotional meeting exercises. After singing Coronation, she read the 37 Ps. the Ps. of trust; "The Christian on his knees sees farther than the philosopher on tiptoes." Min. read and approved. An appeal for the reorganization of the Humane Soc. was made. A Com. was appointed to decide what work should be taken up by S.J. I. Department. Mrs. Meachan, Mrs. Stocks, Mrs. Lincoln, Mrs. Watland. 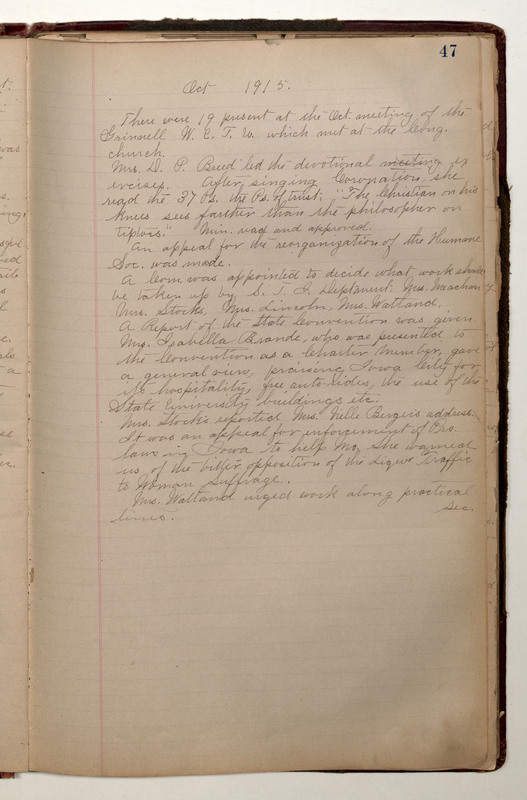 A Report of the State Convention was given Mrs. Isabella Brande, who was presented to the Convention as a Charter Number, gave a general view, praising Iowa City for its hospitality, free auto-rides, the use of the State University buildings, etc. Mrs. Stock's reported Mrs. Nelle Berger's address. It was an appeal for enforcement of Pro. laws in Iowa to help Mo. She warned us of the bitter opposition of the Liquor Traffic to Woman Suffrage. Mrs. Watland urged work along practical lines. Sec.